Plastic Surgeons remove over 4 million tumors and skin growths a year in the United States (ASPS Plastic Surgery Statistics). It is likely that basal cell skin cancer account for many of those surgeries (along with squamous cell, melanoma, lipoma, and cysts). What is basal cell and why is it so common? 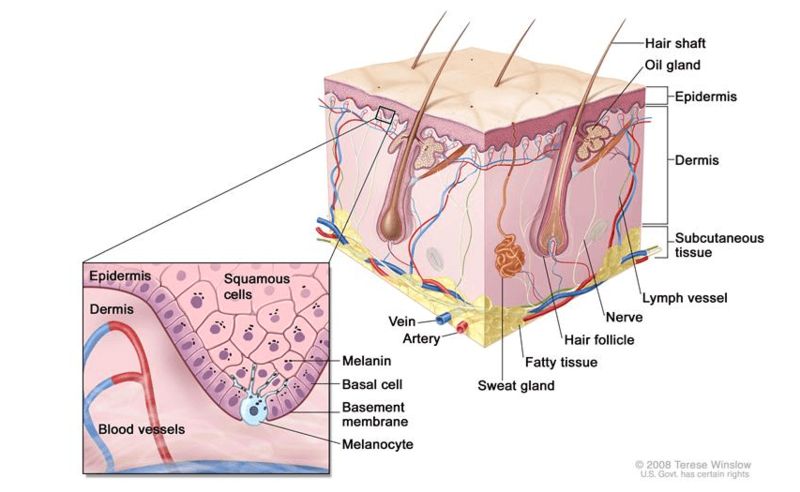 Basal cell is by far the MOST COMMON skin cancer, and it is caused directly by sun damage. It usually grows in sun-exposed areas, and starts with a red scaly patch of skin that sometimes bleeds. The treatment involves removing or destroying the abnormal cells- usually by surgical excision. When found early, these basal cells are typically small and without symptoms. Patients often wonder why they are even treating the area. But these areas will continue to grow and eventually become large and destructive- sometimes tragically so. The cells in the deepest layer of skin (the base layer, hence the name basal cell) absorb the ultraviolet light energy from the sun, causing damage to the DNA. The damaged cells form mutations that cause them to continually replicate and grow, rather than divide in a slow and orderly way. People with fair skin are more likely to develop the disease, and people with a strong family history of basal cell tend to get it more often. Some will only get one or two in a lifetime; others can develop 10 or more. It is a highly variable disease. The skin spots that develop can be biopsied by a small skin scraping. You dermatologist can help decide which areas may need to be biopsied and which can be safely watched. Growing and changing areas usually signal that a biopsy is needed. Diagnosing this common skin cancer early can be a challenge, and that is why routine skin exams by your dermatologist are important. You have just been diagnosed with basal cell skin cancer—now what? The good news about basal cell is that it is easily curable. Unfortunately it often occurs in cosmetically sensitive areas that require great skill to reconstruct – like the nose, lips, cheek, eyelids, or over tight skin, mobile areas like the shoulder or leg. Over the years, plastic surgeons have developed amazing techniques for moving skin and hiding scars that leave the best possible outcomes. Sometimes small lesions require a simple 20-minute excision and skin closure. On other cases, the treatment areas are larger and require a series of surgeries to move skin from one area to another to fill in the defect. Because basal cell carcinomas start in the deep base layer, by the time they show through the surface, the visible part is the “tip of the iceberg”. The actual size under the skin is usually much wider than the visible portion. That is why treatment requires removing more skin than is just visible. Most studies show that removal with 5 mm of healthy surrounding skin on each side gives a 99% chance of complete removal. The piece removed is sent to a pathologist who looks at all edges to make sure the removal is complete. About 1 % will have a microscopic positive margin, requiring a second excision, usually of a few mm to clear the rest of the basal cell. Often the shape of the removal and the margin can be incorporated into the plan of an ideal closure. For example, a basal cell of the side of the nose tip can be removed with proper margins to orient the edges of the defect at the borders of the natural nasal contour changes (what we plastic surgeon call ‘aesthetic sub-units). This way, after rotating and advancing the adjacent skin into the defect, the final scars are placed in less noticeable areas at the border between the tip and the side of the nose and bottom. 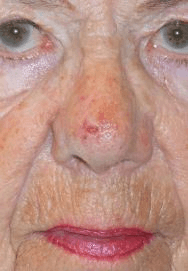 This same concept is used in treating areas of the eyelid, lip and cheek. Other areas like the scalp, arms and legs, do not have as much cosmetic significance, but do have important functional impact. The challenge is allowing full healing in a reasonable amount of time without poor healing or scarring. The is complexity of treatment choices is why we plastic surgeons train for 6 or more years after medical school of doing nothing but surgery, day and night! What is Mohs Surgery and when do I need it? Occasionally basal cells occur in red or sun damaged skin or are in an area where it is difficult to see the borders of the lesion. Some aggressive basal cell types- such as morpheaform carcinomas—also have unpredictable margins. For these patients, we recommend a common treatment called Mohs— where the skin cancer is removed and examined microscopically right away. Removal is then done in layers until it is all removed. The resulting defect can then be reconstructed afterwards by your plastic surgeon. Mohs offers the advantage of immediate microscopic confirmation of complete removal in high-risk basal cells or when there is not a distinct visible margin, Mohs is a very helpful tool. It is most advantageous in the facial areas. The disadvantage of Mohs surgery for basal cell is that is can take several hours versus under 30 minutes for most direct removal. It is not necessary for the majority of skin cancer removals, particularly on the arms, legs or body. Overutilization of Mohs can run up health care costs and be disrespectful of patients’ time. Talk to your doctors about when Mohs is most appropriate. Some more complex skin cancer reconstructions are better performed with sedation in an operating room (usually outpatient surgery). Some patients with significant medical problems, may be best be treated in a surgical center with an anesthesiologist present to monitor vital signs and manage any changes during the procedure. Deciding about sedation can be done in consultation with your surgeon. Sedation procedures are not always necessary, and over use of ambulatory surgery and hospital facilities also can unnecessarily run up costs and time. Talk to your surgeon and primary care physician about which choices are best for you. What will I look like after I am healed? How bad are the scars? Almost everyone is quite anxious about having a basal cell on the face. It is our job as plastic surgeons to calm fears, instruct patients about the surgery and healing process, and be by their side through the healing process to deliver, as fine a result as is possible.The degree of post operative swelling and bruising and the quality of the overall result vary a lot based on many factors: the site of the skin defect after cancer removal, the looseness of the skin around the site, the health of the surrounding skin and health of the overall patient. For most small or straightforward basal cells, removal and closure are done under local anesthesia as an office procedure, and can be done in under half an hour, or a few hours with Mohs. Larger or more complex basal cells require more advanced techniques. 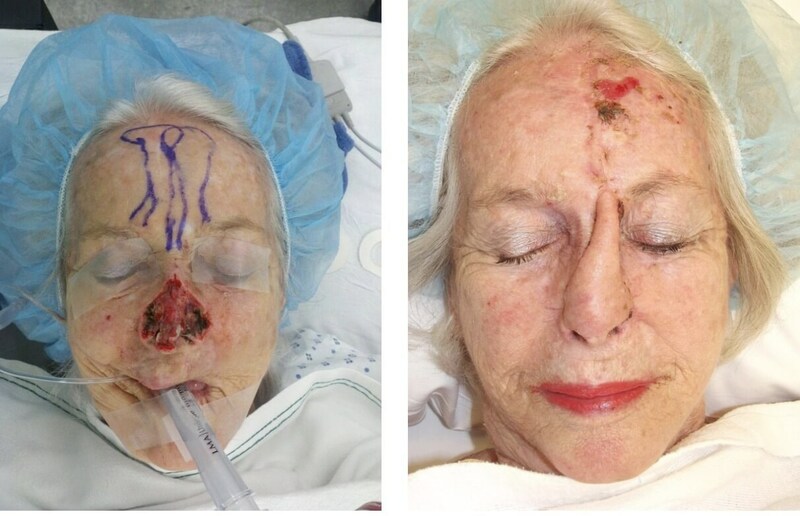 When over 2- 3 cm of skin need to be removed on the face, often more extensive movement of skin is required. Overall results can still be excellent, but swelling and healing my take longer. Stitches are in for about a week. For very extensive basal cell wounds, the creativity of plastic surgeons takes over in creating a great outcome. For a defect that involves most of the nasal tip, the optimal technique is the forehead flap. A piece of forehead skin the same size as the defect after basal cell removal is lifted up while still attached to a strip of skin and muscle underneath. This skin is rotated down to cover the hole. The skin bridge is still attached to the skin area on the nose to nourish is with a healthy blood supply from the underlying muscle. After 2-3 weeks, new blood vessels from the surrounding skin have grown in and the skin bridge is removed. Now the nose looks quite normal! This amazing technique is one of many that allows restoration of a horrendous defect to restore a grateful patient to normal. There are similarly impressive techniques for the body, hand, eyelids, lips and scalp. 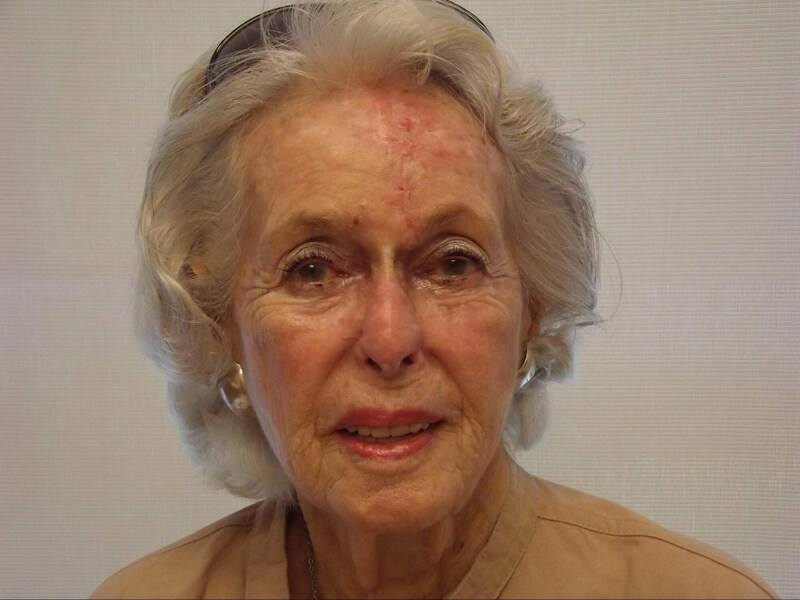 So Dr. Suzman’s best advice is—treat your skin and the sun with respect! Use a daily SPF moisturizer and use a stronger sunblock when in bright sun. We recommend zinc oxide-based sunscreens (you can purchase some excellent Elta MD from us in person or online). Find a dermatologist who takes the time to examine your skin well. And if you do have something that needs to be removed—don’t panic! You can depend on a plastic surgeon to help you. Dr Michael Suzman is a plastic surgeon who has treated thousands of skin cancer patients. He is a member of the American Society of Plastic Surgeons and has been with WESTMED Plastic Surgery since 2002. He is a Clinical Instructor in Surgery at Weill Medical College of Cornell University in New York City.